History Killer helps to protect your privacy by removing traces of computer and Internet activities with a single mouse click. Free scan will help you check the size of disk space you can free. User-friendly interface and simple description will help you securely and quickly kill precisely what is needed. It also includes more than 180 plug-ins and regular plug-in updates for free. It erases locked index.dat files, Windows temp directories and files, Recycle Bin, Windows search/find history, autocomplete forms, the Recent Files list, recent files in Windows Media Player and RealPlayer, Adobe products (Acrobat, Photoshop), Ulead products, Microsoft products, Macromedia products, IrfanView, ACDSee and so one. Within your browser, History Killer erases cache files, the history information, typed URLs, downloaded program files, and cookies, for all common browsers (Internet Explorer, Netscape, FireFox Mozilla, Opera, Flock). It also clears Instant Messenger chat logs, downloaded files (MSN, Yahoo, ICQ, Miranda ICQ, Skype, MIRC etc.) and the Google, Yahoo toolbar search history, MS Office 2003, XP recent file lists and recent shortcuts. 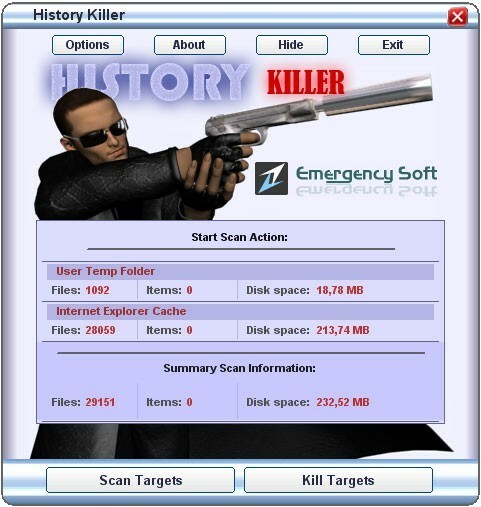 You can also configure History Killer to kill your custom targets - files (using file masks also), folders, and registry entries. Auto-kill action on browser exit, Windows startup, and time scheduler will help you to save your time. Remember, files and traces once deleted with History Killer can never be recovered! PROTECTING YOUR PRIVACY WITH HISTORY KILLER IS MUCH MORE THAN MERELY "PIECE OF MIND". PROTECTING YOUR PRIVACY IS A NECESSITY.